By 1810, James Ward (1769-1859) had established himself as a painter of repute, an Associate of the Royal Academy, and had patrons on whom he could rely. He had had to sacrifice his career as an engraver, although he still retained those skills, of course. His paintings covered a wide range of genres. His original specialities of farm animals and rustic scenes were reliable and steady sellers, and he was showing considerable talent at landscapes, but had yet to produce any major, pure landscape work. He had shown competence in portraits, and classical myths. Although not intended for the public eye, his oil sketches were superb, well ahead of his time, and he had innovated in the portrayal of light. James Ward (1769–1859), An Unknown Woman (1811), oil on canvas, 76.2 x 64.8 cm, Yale Center for British Art, New Haven, CT. Wikimedia Commons. 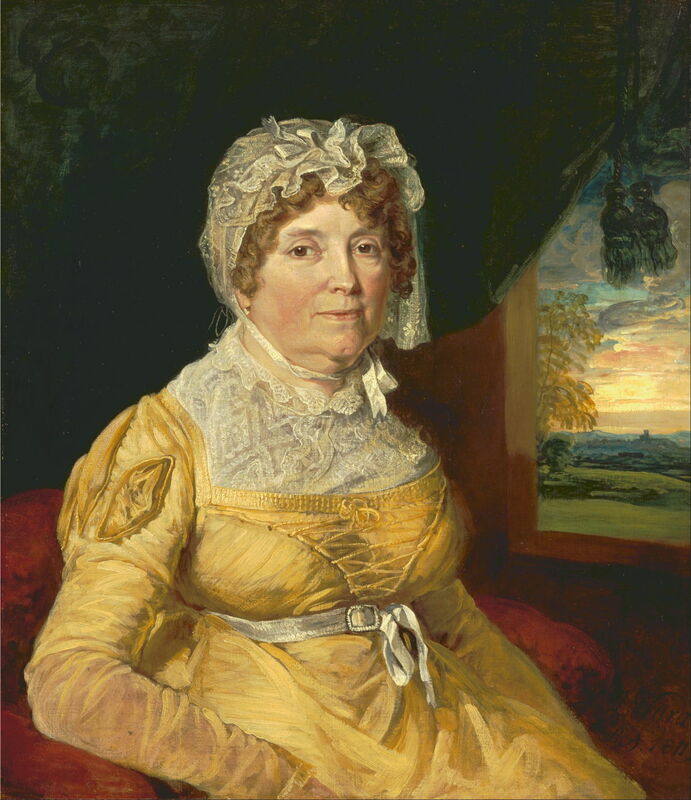 An Unknown Woman (1811) is an honest and skilful portrait of a woman of advancing years, with an unusual and quite ancient feature: a cameo or ‘picture in a picture’ landscape seen through the window on the right, a common feature of Renaissance and earlier portraits. That landscape has the painterly style and light effects of his oil sketches, and may have been the first time that his public got a glimpse of that. James Ward (1769–1859), Studies of Jacky Turner and the Reverend Charles Hope’s Gardener (1800-1815), oil on panel, 22.2 x 29.2 cm, Yale Center for British Art, New Haven, CT. Wikimedia Commons. His figure sketches, in oils, were also quite marvellous. 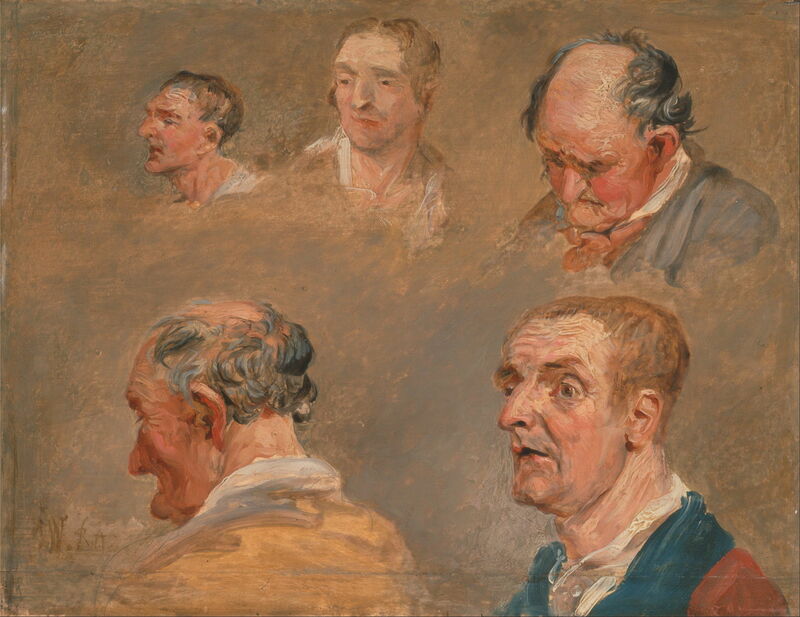 These Studies of Jacky Turner and the Reverend Charles Hope’s Gardener (1800-1815) are rich in character, and hardly the sort of work which Constable or Turner could have approached. To put Ward’s paintings in their historical context, Constable’s Wivenhoe Park was completed in 1816, and his Hay Wain in 1821; Turner was starting his journey into the more radical, with paintings like Snow Storm: Hannibal and his Army Crossing the Alps (1812), but he only painted his very traditional Crossing the Brook in 1815. Ward also drew a great deal, and painted many watercolour sketches. As these are largely undated, it is hard to know where to put them into his works, so I will show some examples here. James Ward (1769–1859), Seashore and Cliffs, with a Horse and Cart and a Beached Boat on Shore (date not known) watercolor on medium, rough, cream wove paper, 10.5 x 23.2 cm, Yale Center for British Art, New Haven, CT. Wikimedia Commons. Seashore and Cliffs, with a Horse and Cart and a Beached Boat on Shore is a small, bright watercolour sketch which makes good use of the texture in the paper; in that it appears almost modern. 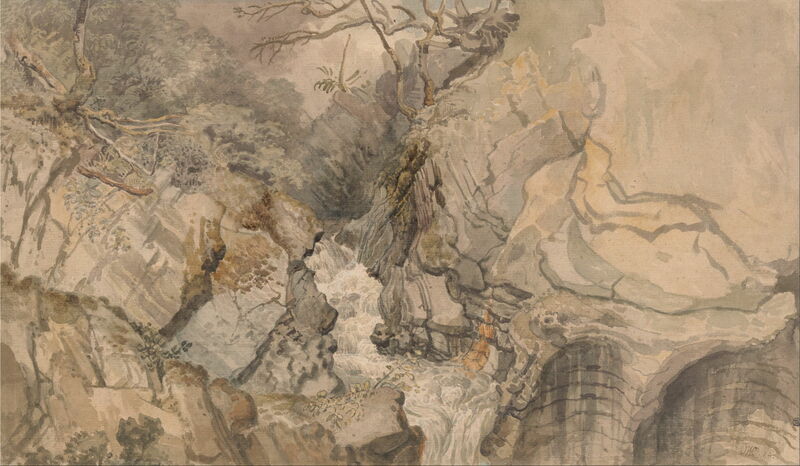 James Ward (1769–1859), Mountainous Landscape (date not known), brown wash on medium, smooth, cream wove paper, 3.8 x 8.6 cm, Yale Center for British Art, New Haven, CT. Wikimedia Commons. His Mountainous Landscape is a tiny gathering of brown washes and gestural marks which convey the impression of the landscape with amazing economy. James Ward (1769–1859), Looking Upwards from Devil’s Bridge, Cardiganshire, Wales (date not known), watercolor and gouache over graphite on medium, moderately textured, cream laid paper, 35.2 x 60.3 cm, Yale Center for British Art, New Haven, CT. Wikimedia Commons. Ward was also far advanced in exploring the effects of point of view: Looking Upwards from Devil’s Bridge, Cardiganshire, Wales is a larger and more carefully rendered sketch in watercolor and gouache which is supremely vertiginous. This was long before pioneer photographers started to capture this type of image with their lenses. 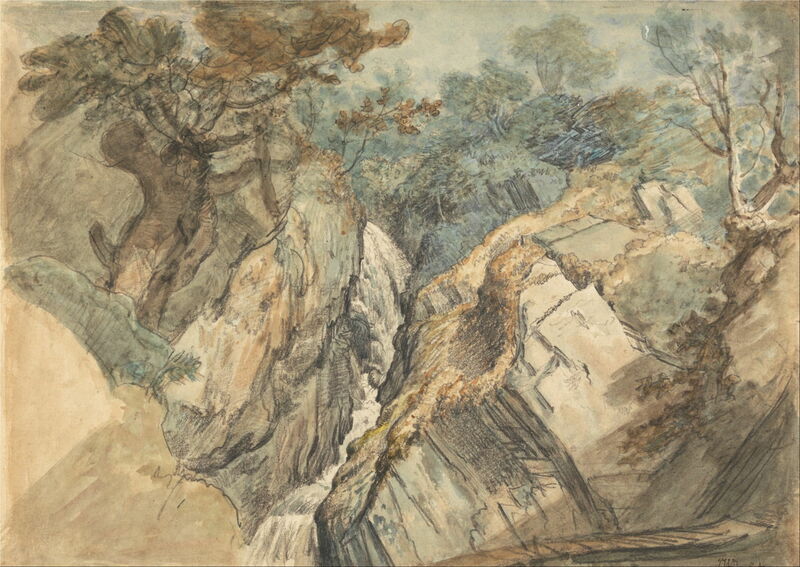 James Ward (1769–1859), Waterfall, North Wales (date not known), watercolor and black chalk on medium, slightly textured, cream wove paper, 33.3 x 43.2 cm, Yale Center for British Art, New Haven, CT. Wikimedia Commons. Waterfall, North Wales is less vertiginous but more practical with its colour washes, in which the yellow of the original greens has sadly faded to leave them looking very blue. Ward still preferred to make oil sketches when he could. In about 1811, the year that Ward was finally elected a full member of the Royal Academy, and in which he showed eight paintings at its annual exhibition, he received his first commission for a major landscape work, for Lord Ribblesdale. 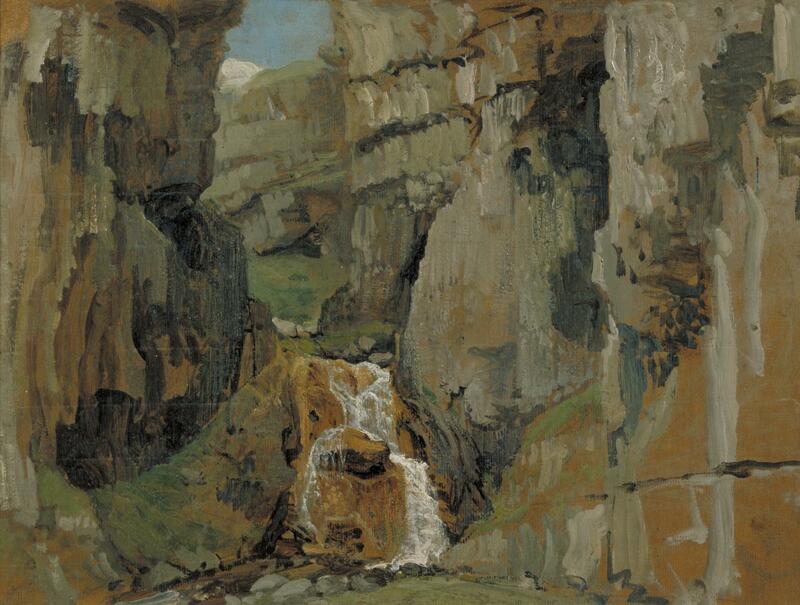 His Sketch for ‘Gordale Scar’ (1811) is one of several made in preparation. Lord Ribblesdale’s son and heir, Thomas Lister, invited Ward to stay at Gisburn Park, the family seat in West Yorkshire, commissioning him to paint one of his horses. Lister also attempted to persuade Ward to help him improve his own amateur painting, but Ward fended him off by quoting the prodigious sum of five hundred guineas for two months tuition. Gordale Scar is a huge limestone ravine in the wild country of North Yorkshire, through which a stream, Gordale Beck, flows. Ward sketched the Scar, which the critic and collector Sir George Beaumont (a friend of Constable as well as Ward) had declared was unpaintable. On the strength of those sketches, Lord Ribblesdale commissioned Ward to paint a large canvas to hang in the new dining room which he planned for his house at Gisburn. 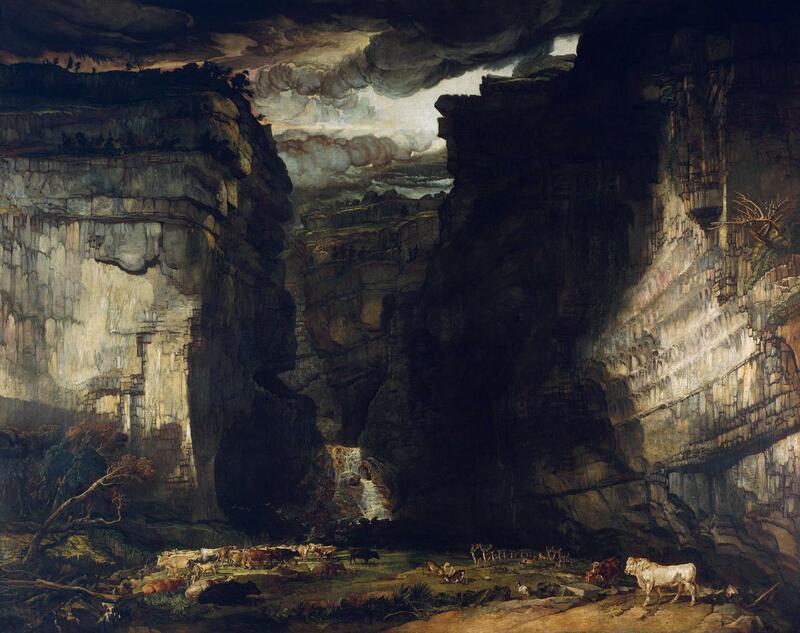 The finished Gordale Scar, or A View of Gordale, in the Manor of East Malham in Craven, Yorkshire, the Property of Lord Ribblesdale in its extended title, (1812–15) is a vast canvas more than 3 x 4 metres in size: Ward’s ultimate expression of the Burkean sublime. This not only approached the impression of awe instilled by the original location, but gave Ward the opportunity to include his most extensive collection of animals. James Ward (1769–1859), Gordale Scar (A View of Gordale, in the Manor of East Malham in Craven, Yorkshire, the Property of Lord Ribblesdale) (detail) (1812–15), oil on canvas, 332.7 x 421.6 cm, The Tate Gallery (Purchased 1878), London. Wikimedia Commons. There are around thirty head of cattle, including the white prize bull in the right foreground, two herds of deer including a pair of stags fighting, and the occasional sheep or goat. Despite Ward’s frequent claims that, unlike Turner, he painted true to nature, his final painting shows a view which does not actually exist, with a collection of animals (the deer, in particular) which could not have been present. It was first shown at the British Institution in 1814, where reactions were mixed, then at the Royal Academy the following year, following which it was rolled up and delivered to its owner. Once stretched out again, it proved too large to display where it had been intended. Another major commission of this period was View in Tabley Park, or Tabley Lake and Tower (1813–18), for its owner, Sir John Fleming Leicester; the Palladian-style house near Knutsford in Cheshire, England, had originally been built for Sir Peter Byrne Leicester in 1761-69. 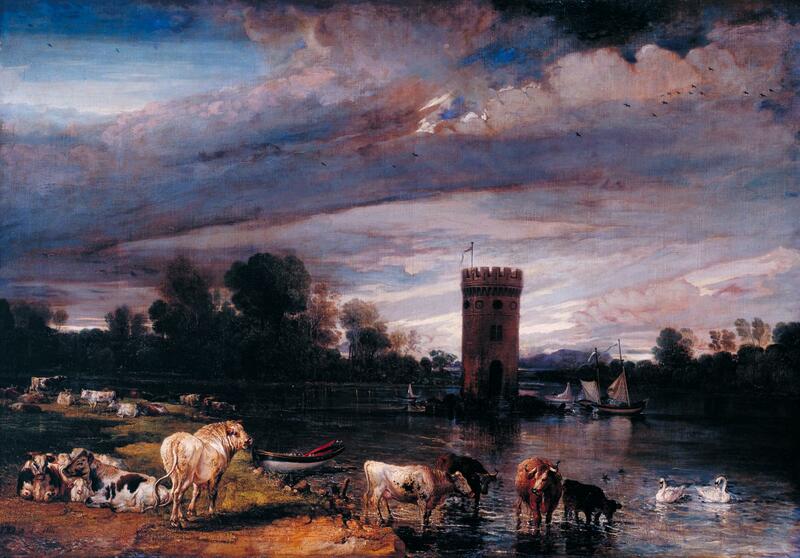 This patron already had a view of the lake and tower painted by JMW Turner, but Ward damned that work with his faint praise, claiming that it took ‘poetic liberties as to the Picturesque’, something which Ward felt that he would avoid by painting the truth. This was exhibited at the Royal Academy in 1814. Although dominated by its distinctive dusk colours and light, Ward once again manages to show off his skills in painting cattle, with another fine white bull swishing its tail at the viewer. Technically, Ward’s claim of truth may be justified, and this is another successful and atmospheric landscape. Leicester had bought his first painting from Ward in around 1806, and clearly became a good patron to the artist. 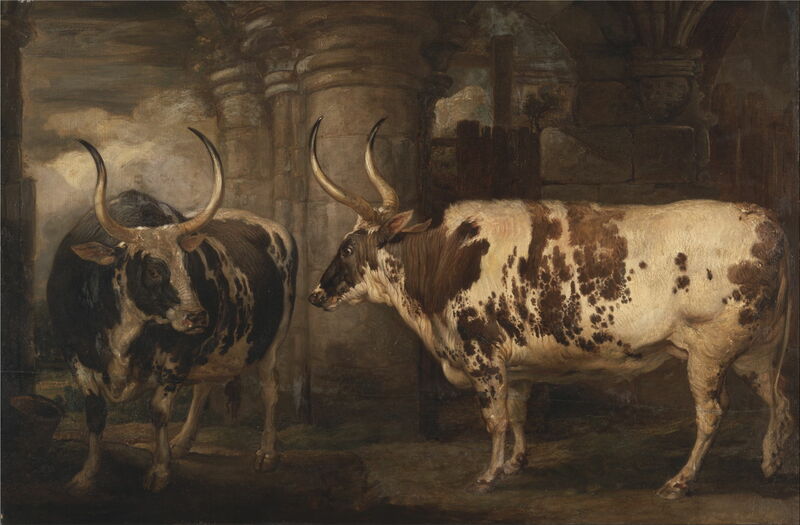 James Ward (1769–1859), Portraits of two extraordinary oxen, the property of the Earl of Powis (1814), oil on panel, 90.2 x 135.3 cm, Yale Center for British Art, New Haven, CT. Wikimedia Commons. Ward still painted some farm animals, such as his Portraits of two extraordinary oxen, the property of the Earl of Powis (1814), but at this time his best commissions were for equine portraits, for the country gentry. James Ward (1769–1859), John Levett Hunting at Wychnor, Staffordshire (Theophilus Levett and a Favorite Hunter) (1814-1818), oil on canvas, 116.8 x 145.4 cm, Yale Center for British Art, New Haven, CT. Wikimedia Commons. 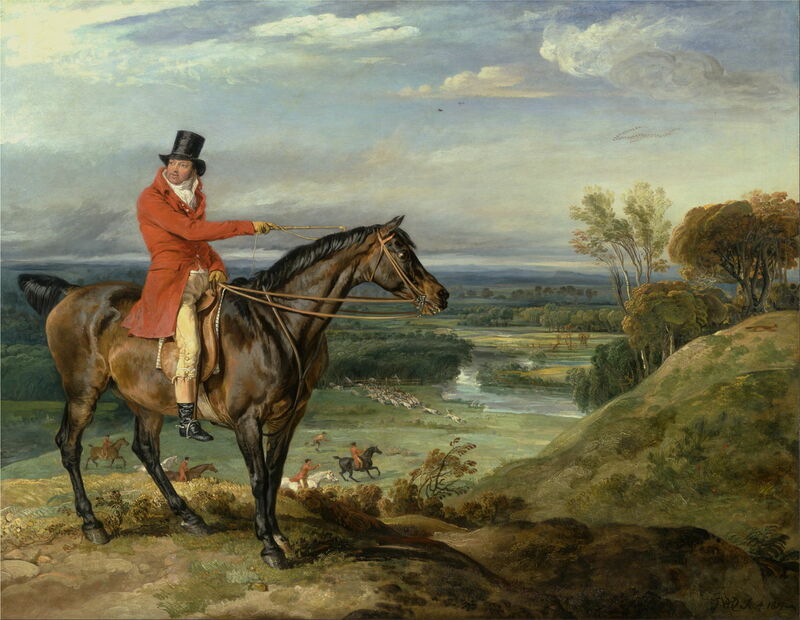 John Levett Hunting at Wychnor, Staffordshire (Theophilus Levett and a Favorite Hunter) (1814-1818) looks too good a landscape to be just an equestrian portrait. The Reverend Theophilus Levett seems to have bought his first painting from Ward in 1809, followed by a commissioned family portrait in 1811. This commissioned painting was probably completed in 1817, and most probably shows Captain John Levett, the oldest son, on his hunting horse, with the local hunt in the background. At this time, Ward was hard at work on his next major and huge painting, The Triumph of the Duke of Wellington. This was commissioned by the British Institution, as its response to Wellington’s victory at Waterloo in 1815. The Institution put this out to competition, and Ward’s preliminary study – itself around 1 by 2 metres – had been selected for the premium of one thousand guineas, and exhibited in 1816. I will complete this chapter in Ward’s career in the next and final article.